Selling is the core essence of every business. Whether you’re selling a product, service or idea, your business needs customers to stay afloat. Amidst the selling process, we all come across road blocks that prevent us from making deals. We complain about the economy, the quality of the product, the price among other issues for not closing deals, and forget to focus on how we can improve our business to achieve success. 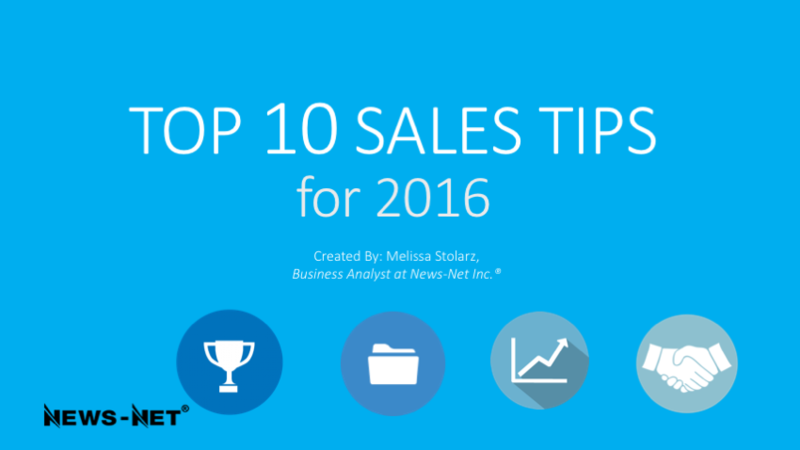 “Top 10 Sales Tips for 2016” booklet contains key points on developing a solid sales pitch and building relationships with customers. These tips touch on a variety of different aspects of your business and how they relate to your success in sales. Whether you’re a manager, sales individual or tech engineer, you will be able to gain some new insights into successful selling. Let’s look at one of the tips from the booklet. Tip #3: Free Yourself from Admin. Talk More. You can only move prospective clients along the pipeline if you spent enough time talking to them. However, most sales people spend around 60% of their time on tasks not related to selling activities. You need to free yourself from admin by using technology that increases admin efficiency and gives you more time in front of prospective clients. News-Net Inc.® is a trusted partner and software service provider for newspapers and publications since 1984.